KIU (Knowledge International University) has scheduled an online live lecture by Shaykh Ahmed 3Abdul-Wahaab, one of the instructor at KIU. This lecture is Free and open to everyone already in a distance learning Islaamic program or anyone intending to join one. The talk will discuss several ‘better practices’ that a student of knowledge can exercise to enhance their distance learning experience. The lecture will be followed by Q&A session. Please click here to see the corresponding time in your country. There is no enrollment/registration for this lecture. Click the following link to join/listen to the lecture at the scheduled time. “KIU” is offereing a special discount for its upcoming Fall 2015 Semester of BAIS Program. All prospective students, enrolling and paying in first 2 weeks will get a 50% discount. The registration is open now & the classes are starting from Sunday, 6th September 2015. Last day to register is 6th September 2015. For more details about BAIS degree program & how to apply, click here. Students applying for the degree program are required to take 5 courses per semester. But there is also an option to study individual courses (of BAIS program), where the students can take courses as per their convenience, schedule & interest. Students can select from different courses. For more details about the courses and instructors, click here. 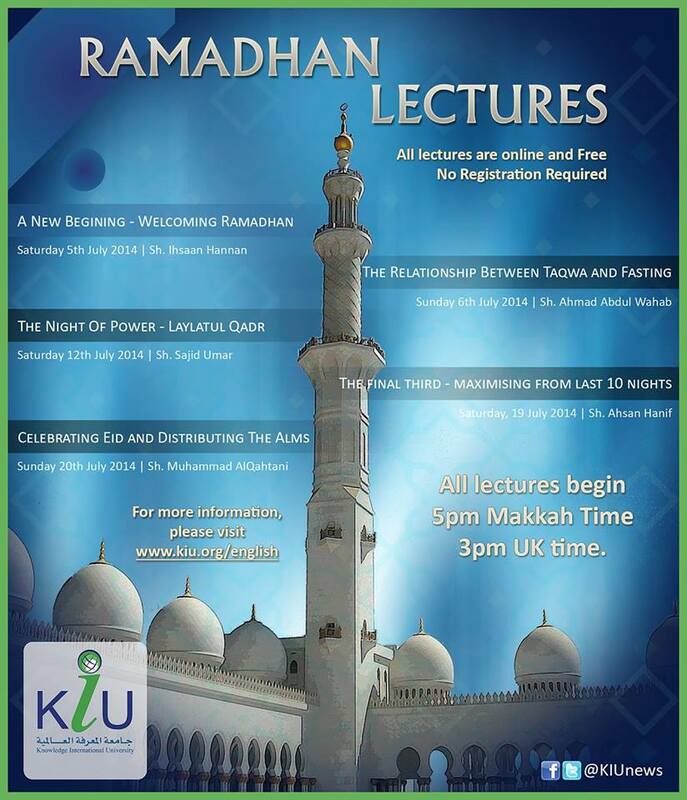 “Knowledge International University” is offering online Ramadaan lecture series, starting from 5th July 2014. The series is free & there is no registration required. For serious students of knowledge & those who would like to study sound & authentic knowledge, Shaykh Ahmad Jibril is teaching a free Tawheed course, that is available online to watch and download for free. Each video session/class is 45 minutes to 1 hour long. The classes are also available in MP3 format. Links to all the previous classes, course book and transcribed notes are updated here. New class links and details about the exam will also be posted here. Those on Facebook, can also follow the updates from shaykh’s Facebook page. An exam will be held at the end of these classes/course and successful students will be rewarded certificates. Knowledge International University has scheduled a free online lecture by Shaykh Sa3d Ash-Shethry. The lecture will be translated live by Shaykh Sajid 3Umar. 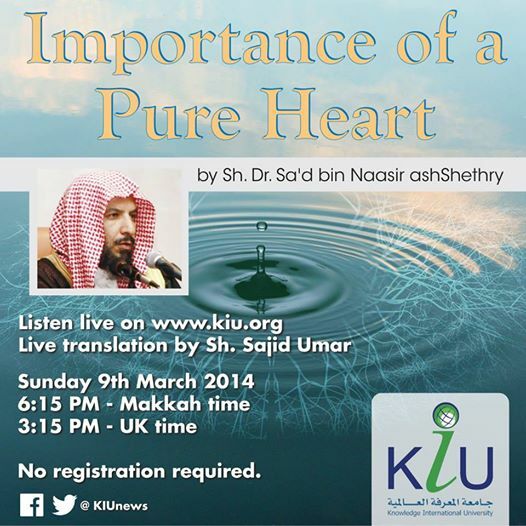 Shaykh Sa3d Ash-Shethry is the founder of KIU, and former member of the ‘Council of Senior 3Ulamaa’ Saudi Arabia. 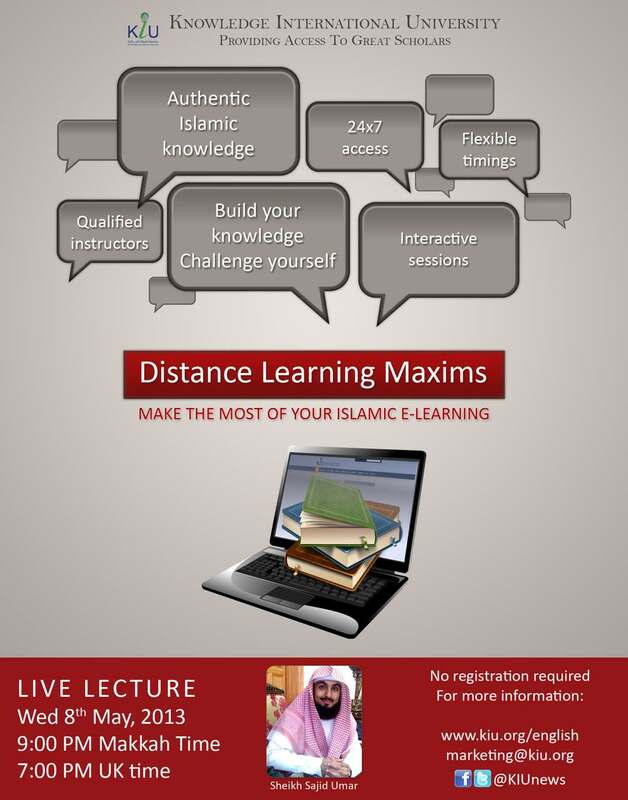 Shaykh Sa3d holds a doctorate in the field of Islaamic Jurisprudence Methodology. He is also the author of several books explaining intricate topics found in the various Islaamic Sciences, and has revised, authenticated, and explained a large number of texts. There is no enrollment/registration for this lecture. The link to attend live lecture will be available at KIU website. 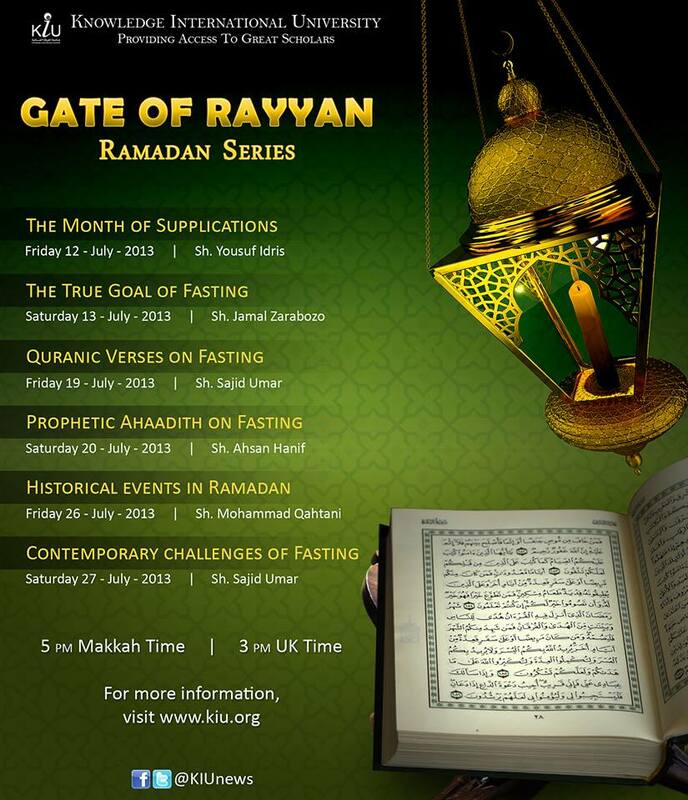 “Knowledge International University” has organized a 6-day online Ramadaan lectures series “Gate of Rayyan” on the weekends. Click below to access Live lecture. Beneficial advice by Shaykh Nabeel Al-3Awadhi about how to utilize our time during Ramadaan. A short concise reminder to welcome Ramadaan in the best way. Our Eemaan needs to be renewed and Ramadaan is the best time to renew our Eemaan, our relations with Allaah 3Azza wa Jall. Do we really long for the pleasure of Allaah, wanting Allaah’s pleasure in every action? where we stand in our relationship with Allaah? Reflections on some beautiful aayaat, beneficial steps to feel the sweetness of Qur’aan when we read in Ramadaan & during Taraweeh. A nice lecture on how to excel and benefit in Ramadaan inshaa’Allaah, by brother Abu Mussab Wajdi Akkari. Brother Abu Mussab works with Jeddah Da3wah Center. Ramdaan is just round the corner. A practical beneficial read, that we all need to gain the maximum benefits from Ramadaan as we prepare for the arrival of this blessed month. “We dont feel the beauty of Ramadaan & 3Ibaadah as our hearts have some problems. unless we clean our hearts from all hatred, sins & all internal diseases, we wont feel the beauty of 3Ibaadah and the sweetness of Ramadaan. 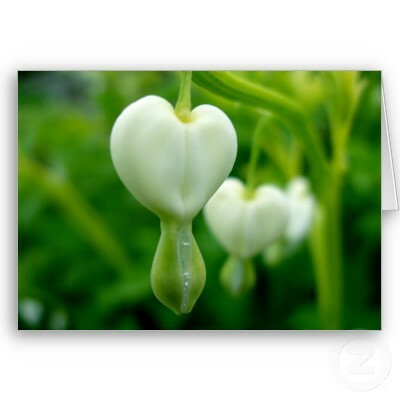 How Do we clean our heart. Read below. Knowledge International University has announced a free online live lecture by Shaykh Sajid 3Umar. So what did the Prophet sallAllaahu 3Alayhi wa Sallam tell us to do in these days? Many people mistakenly believe that you chant this only on the day of 3Eed. But, it is meant to be recited from the beginning of Dhul-Hijjah. Bukhaaree related that Ibn 3Umar & Abu Hurayrah said that they used to go out in the streets making loud takbeer. They did not think that this was riyaa [showing off]. They were busy with declaring the signs of Allaah. This practice has now become a forgotten Sunnah. Why do people feel shy to follow this Sunnah? These are the days of takbeer, tahleel & tahmeed with raised voices. Therefore revive this Sunnah by doing audible tasbeeh during all of the ten days of Dhul-Hijjah. Therefore, send your darood & salaam from your heart. Feel that special honor in doing that deed. All kinds of dhikr will make your relation with Allaah stronger and stronger. How many Muslims are there today? 1.5 billion? In one minute it is possible to gain 1.5 billion hasanaat. How generous is Allaah subhaanahu wa ta3aalaa. No one will give you like Allaah subhaanahu wa ta3aalaa gives. So how can you gain 1.5 million hasanaat? Just say “Astaghfirullaah” for yourself and for all the believers, from your heart. Allaah subhaanahu wa ta3aalaa is forgiving & generous. On the Day of Judgement, when you will see your book, you will find the record of your sins in it & you will feel regret. But, SubhaanAllaah, you will find between these sins, Astaghfirullaah, Astaghfirullaah, Astaghfirullaah. Bi-idhnillaah. Allaah, the Kareem will cancel those sins that have istighfaar beside them, around them, after them. Indeed, rahamaat are falling down like rain. So try to be under those rahamaat. Look at it this way – there are seasons of mercy during which Allaah sends down abundant mercy [like during Ramadaan, like the days of Dhul-Hijjah, etc.]. Allaah is always generous because that is one of His subhaanahu wa ta3aalaa Attributes, but He says that He gives more during certain periods. Allaah isRaheem always, but He says He has more mercy during a certain period. These days are like those special-rate promotions or sale season. Therefore, don’t leave or ignore this sale. Go and ask for more. Keep saying ‘astaghfirullaah’, ‘astaghfirullaah’, astaghfirullaah’, keep insisting on it till Allaah forgives you. Start from the beginning of Dhul-Hijjah. We are informed that there is no punishment from subhaanahu wa ta3aalaa on the yastaghfiroon [i.e. those who seek forgiveness]. Allaah relieves all problems with istighfaar. Those who are persistent in istighfaar in their lives, disasters and calamities will be repelled from them. Mercy is like a cloud on the head of the mustaghfiroon [those who consistently seek forgiveness]. Allaah is telling us to make istighfaar to gain His mercy. Let your istighfaar ascend to Him and His mercy will descend upon you. Allaah loves the good deeds in these days. Allaah loves siyaam. Put these two beloved things together, you are the doer of the things Allaah loves. He subhaanahu wa ta3aalaa will Love you, bi-idhnillaah. Any 3Ibaadah, be it salaah, dhikr, Qur’aan, that is done during some periods of time and with them are also periods of non-action. Can you do any of them from Fajr till Maghrib continuously? Which 3Ibaadah will you be able to do non-stop? From Fajr till Maghrib during the best days, you will be able to be in a continuous state of worship. So please my sisters [& brothers], grab this chance eagerly. Also don’t forget you have if Allaah wills, at least one du3aa’ guaranteed with each siyaam – at the time of breaking the fast. So that is nine opportune moments during this period. Does this mean that we can fast on that day and for the rest of the year we can do whatever we want of bad deeds? No! It implies that Allaah subhaanahu wa ta3aalaa will help us to abstain from sins. And, if you commit a sin by mistake, He subhaanahu wa ta3aalaa will cancel it due to His promise. Spending for the sake of Allaah! Only Allaah knows how many trials & calamities have been pushed away from us, our family and loved ones as a result of our sadaqah. Allaah knows how many times relief and ease has come to us due to the sadaqah we gave. Therefore, give in the way of Allâh, as much as you can. Don’t leave any raised hands return empty. Show Allaah that you love Him by spending from that which you love. Show Allaah subhaanahu wa ta3aalaa that all these things mean nothing besides gaining His ridha [pleasure]. Don’t look and remind yourself of what you have already spent in the past. If Allaah wills, He subhaanahu wa ta3alaa has accepted and written it for you. Now, think of how you can outdo that sadaqah during these days. Spend from what you love and Allaah will love you. If it is difficult for you to call or meet every relative, then send them a message. But write with your heart and with the right intention. There is a man who connects with all of his near and far relatives. It is almost like a mission for him for the sake of Allaah. He subhaanahu wa ta3aalaa loves this 3ibaadah. Even those who are far away, he calls and connects them to the rest of the family and brings them all together. And subhaan-Allaah, Allah has given him a lot of wealth and with such ease and has made his life easy, and as a result of his deeds. These were just a few of the wonderful things we can do during the forthcoming best days of Dhul-Hijjah. Therefore, if we want Allaah’s help with these deeds and our schedule for them, we need to do a lot of tawbah. The Salaf as-Salih used to say that they would feel prevented from qiyaam al-layl due to their sins. They knew that when they want to do 3ibaadah and they are unable to do it, it is due sins. A lot of istighfaar with tawbah, real Tawbah! Transcription of a lecture “How to benefit from the blessed days of Dhul-Hijjah” by Umm 3Abdur-Rahmaan. Original source Shaykh Muhammad Hussain Yaqoob’s lecture. The “ten nights” which Allaah subhaanahu wa ta3alaa is swearing here, are the first 10 days of Dhul-Hijjah. Allaah [subhaanahu wa ta3alaa] swears an oath by them, and swearing an oath by something is indicative of its importance and great benefit. Ibn 3Abbas radi Allaahu 3anhu narrated that Prophet sallAllaahu 3Alayhi wa sallam said: “There are no days in which righteous deeds are more beloved to Allaah than these ten days”. Have the intention to spread this important information. It is a great chance to collect uncountable hasanaat [rewards]. It is a great chance to renew your relation with Allaah [subhaana wa ta3alaa]. Prepare now so you can start from the first night/day of the month [i.e. as soon as Dhul-Hijjah is announced]. You don’t want to miss a moment of the best days in the sight of Allaah [subhaanahu wa ta3alaa]. Therefore, be very vigilant and don’t waste these precious moments. Ask Allaah to help you to benefit from this period of His special Grace. Plan to complete the reading of the Qur’aan within this period. If you read three juz (parts) a day, it can be accomplished. It is not difficult. Ask Allaah to make it easy for you. We know reciting one letter is equal to ten hasanaat [rewards]. If you read three juzz’ everyday, it translates to thousands of millions of hasanaat. And this calculation is just based on the 1=10 ratio. These are special days of His Grace. Therefore, don’t even think about how much Allaah can/will increase & add it for you. You cannot fathom it. He is Al-Kareem. He knows that you have ikhlaas [sincerity]; He will not count it as 1=10. He could raise it to 1=700 or even more. And this is what you can earn every day of these special days. Keep in mind that reciting the Qur’aan is a good deed and Allaah specially loves the good deeds done in these days: “And if He [subhaanahu wa ta3alaa] loves the good deeds, He will love the doer of those good deeds.”  If Allaah loves someone, He will not punish them. Remember this concept so that the deeds you do come from your heart [don’t be like a machine]. Honor the rights of the Qur’aan when reciting it. Do you really want to be closer to Allaah? Do you really love Allaah and seek His closeness? If, you want this, then know that Allaah teaches you the means to gaining His qurb [closeness]. This is the way! Prostrate in sujood to Him [subhaanahu wa ta’alaa] and you will be closer to Him. Remember, the Prophet sallAllaahu 3Alayhi wa Sallam loved us and he knew that we have a lot of needs from Allaah. This is why he taught us the way to get those needs fulfilled. Therefore, if you have needs, then you cannot leave sujood. Any sajdah without khushoo3 [focus] & without du3aa’ [like your forehead is touching the ground and your mind is in the kitchen or the office] is a big khasaara [regretful loss]. Let us not be losers from now on bi-idhnillaah. When the Prophet sallAllaahu 3Alayhi wa Sallam instructed us to do a lot of sujood, it means to perform a lot of salaah [prayer]. “With each sajdah for Allaah, He will raise you a level with it. And cancel a sin with it.” So, the more you increase in your sujood, the closer you are to being a winner. “Al-Awwaab’ (الاوّاب) means one who is obedient, or one who turns to obedience. Bi-idhnillaah, we want to show Allaah that we are of those who are obedient. Bi-idhnillaah, you stand to gain the mercy of Allaah because of the du3aa’ of Prophet sallAllaahu 3Alayhi wa Sallam. Do you want the mercy of Allaah to reach you? Don’t leave these 4 rak3aat. e] Salaat at-Tawbah: It could be any bad deed, any sin, you hear something bad [backbiting], you see something bad, you feel your heart constricted because of something you have done and you didn’t mean it, etc, you can erase it immediately with your prayer of repentance. Make a good wudhoo’ and offer two sincere rak3aat of repentance. Ask Allaah to forgive you. If it’s from your heart, then know that Allaah will cancel your sin. g] Qiyaam al-Layl: With this prayer, we hope that Allaah will illuminate our graves; will bestow Noor on our faces; will cancel our bad deeds, bi-idhnillaah. Pray at least two rak3aat. If you are able to follow the Sunnah, then pray all 11 rak3aat [including witr]. Remember that in these special days and nights, Allaah is sending His special mercy. Do you think that this special mercy will reach everybody? Do you think that it will reach the one who is in front of the TV watching a movie? Or do you think it will reach the one who is making sujood, rukoo3, tilaawah, making istighfaar, etc.? We have to show Allaah that we want this special mercy. We need to make ourselves eligible for it. Allaah subhaanahu wa ta3alaa swears by the night [Soorah Fajr]. Therefore, take care of the nights. Don’t be among the losers. And, now that it is winter, we get really long nights. So it’s a good chance to maximize our hasanaat. Don’t forget while you are praying qiyaam that Allaah subhaanahu wa ta3aalaa loves this deed. Therefore, He subhaanahu wa ta3alaa loves the doer of this deed also. If we were lazy before, we will be active and good from now on bi-idhnillaah. We will not be among the losers. If these days and nights are a king who is distributing gifts of gold while announcing: “Come take these gold nuggets”, wAllaahi, you will find people standing in long queues and hordes to collect them. Subhaan-Allaah!! Allaah is sending [special] mercy during these days. He subhaanahu wa ta3alaa is accepting supplications. He subhaanahu wa ta3aalaa is offering unimaginably wonderful blessings that we don’t even know of. So will we not work to get in those lines to gather Allaah’s gifts?